Sandra Burchartz knows how to get directly in to the heart of the viewer and speaks with her paintings, illustrations and designs the language of feeling. Her own specific style is very evident in her own free work, as well in the work, which she makes in commission. This is partly fueled by her years of traveling, living and working in different parts of the world, cities and cultures. Global influences which has inspired her very much to use different color, light and atmosphere. Burchartz ‘fashion background’ is apparent in the illustrated cards series that she made in commission for a Dutch publisher. In her portfolio you will find also a lot of other work that she painted for companies and individuals. Burchartz attended the Amsterdam Fashion Academy and the well-known Gerrit Rietveld Academy of Art, in Amsterdam. 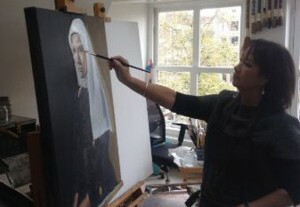 Further took a master class in the Florence Art Academy and a master class with the painter Xenia Hausner in Austria. She currently works from her studio in Amsterdam and Barcelona.